Mumbai: India Book House Pvt Ltd, 2006. Hot pink! Prismatic silver text! Arty black and white photo of Abhishek! When I saw this beautiful hardback at Gangarams Book Bureau in Bangalore (fantastic shop!) back in 2006, I was immediately enchanted based on the cover alone and gleefully added it to my stack of books at the cashier's desk. But once I got it home, I kept picking it up only to thumb through the photos and then put it back on the shelf, drawn to things with more enticing-looking text. Now that I've read it, that proved to be a sensible reaction. This book looks fantastic and has some clever visual and tactile tricks up its sleeves, but its words are overall unremarkable. But let me back up. 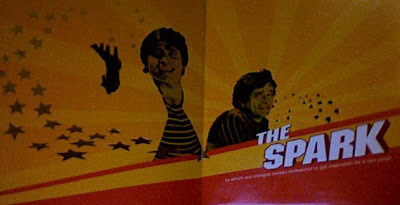 Somebody on the team of this project came up with a clever and lovable idea for organizing what feels like a fairly standard overview of the elements of making popular Hindi cinema: the structure follows two aspiring filmmakers, Vijay and Ravi, as they try to get their script idea turned into a movie! VIJAY AND RAVI. I'm actually glad I didn't read this book in the summer of 2006 because I hadn't seen any Shashitabh films yet (and hardly any 70s masala) and wouldn't have understood why this is such a funny and perfect concept. 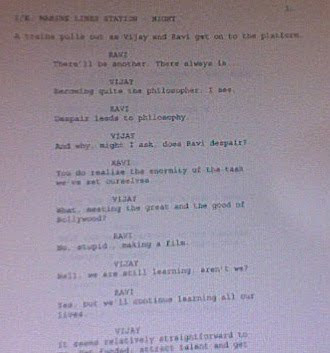 Each chapter begins with a few pages of dialogue between Vijay and Ravi before they go off to talk to writers, cinematographers, stars, directors, editors, etc. Even better, these dialogues take the physical form of a movie script glued on to a page, complete with location and bits of blocking. You can't see it well in this photo, but the stars are shiny silver. After these introductions, each chapter is basically a compilation of quotes of varying length from big names in the business, following the narrative device that Vijay and Ravi are traipsing around Mumbai to ask a range of experts for their advice. Even if I wasn't familiar with the name of, say, a production designer, if I just kept reading I realized I had seen some of his work. Note: I say "his" deliberately. There are very few women featured in this book, with Aishwarya being the most prominent, and no women are in the list of "young turk" directors. Nor is there any discussion of the disparity. Boooo! Apart from quotes (which again are not cited! ), the text describes and contextualizes the films discussed, which vary nicely from the very famous - Sholay, Lagaan, Karan Johar films - to things I hadn't heard of and have no desire to see, like Kaal, and gives background on the featured interviewees. It occasionally reintroduces Vijay and Ravi to comment on common features of films or filmmaking related to the chapter's theme, like Ravi chatting up a gori backup dancer in one of the chapters about shooting. (p. 86) The author did a good job at choosing which quotes to use, and it seems that the book team found some subjects who were willing to think a little bit and say something interesting. (Or maybe they were just sucking up? Hard to tell!) That in itself sets this book apart from countless interviews with stars about their latest releases or their thoughts on celebrity. There are funny turns from KJo and thoughtful reflections from Javed Akhtar, but then there are doozy little one-offs, like Mallika Sherawat talking about the supreme importance of the script (p. 16) or the unfairness of film censorship when other art in India is not subjected to such control (p. 113), Anu Malik being furious that his music was used uncredited in Moulin Rouge (oh the irony!) (p. 67), or Abhishek Bachchan being embarrassed to shoot a glitzy song in the vicinity of his former school in Switzerland and hoping he wouldn't be recognized. ** There's a touching reflection from Aamir Khan about Lagaan's Oscar nomination in 2001: "For me it was a victory, in a sense. It was very satisfying to know that the world audience looked at a mainstream film from India that was made exclusively for an Indian audience and just loved it. It was a moment of great pride and happiness that a film with songs, with our form of telling a story, has really gone down well with an international audience. That was a great joy!" (p. 232) Masala zindabad! Not all of the quotes are enlightening, but enough of them are that I wanted to keep reading. However, there is very little analysis or synthesis of what Vijay and Ravi learn. This is more of an assortment of observations with backing information than it is any kind of monograph. To be fair, I think that's about what was intended; in the author's note, Ramachandran says the book's primary photographer had been commissioned to produce a coffee table book on the film industry (p. 244), and indeed that's what they made. Given that it is mostly a collection of quotes from important and/or knowledgeable people, an index would be really useful so you could go reference a particular person's thoughts easily or look for a range of names on certain topics. It's easy enough to guess where Farah Khan will appear, but Shahrukh and the like are spread throughout. and geegaws, like an arrow emblazoned with Preity, Saif, and Hrithik shooting out of a heart labeled "objects of desire" or, below, a spinner that helps you select a big name in the chapter on stars. Some of them are just for fun, like the above, but some of them make very important points. 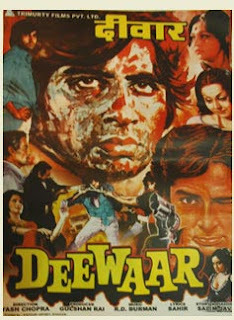 In the chapter on scripts and writing, there is a a print of a hand-painted poster of Deewaar. It's folded up inside a regular page, so it takes two steps to get to it. You start with a pictue of Javed Akhtar on a regular page of text, and, as you unfold, the next thing you see is this striking image. 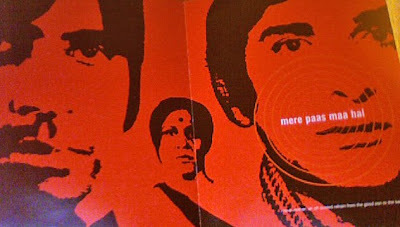 I love how the designer has abstracted and boiled down such a heavy film (and one of its common images), whose fuller cast and some action episodes are jumbled together in the full poster inside, into this one moment, the two brothers not relating to each other in any way and so large they spill off the page, with tiny little Maa between them, sort of stunned and quiet-looking. The action, the accessories, and the friends have all fallen away. Brilliant. What I like most about the design is it's fun, just like watching movies is fun. The look of the book perfectly supports its celebratory tone - and in fact, I'd say the look is more enthusiastic and more expressive than the words. Lights Camera Masala is a spirited, cheerful romp around the film industry, full of people you know sharing observations about their work. I don't recommend this book to people who are new to Bollywood - there are too many names of films, stars, and crew to make sense of, and such readers probably wouldn't get much of the humor of the textual and visual references. For the rest of us, it's an entertaining and engaging reflection on who and what puts the life, sweat, and heart in Mumbai's movies. ** I found this story endearing, so here's part of it: "As professionals, we bare our soul to the camera every day, but there are times when it really gets to you. You actually can't do it.... [But] after the first shot, you are like 'Dude, I am having a blast!' That's it. You could not care less after that." (p. 111) Cute! And dude, we are having a blast too! "Anu Malik being furious that his music was used uncredited in Moulin Rouge (oh the irony!)" made me laugh out loud in the middle of the break room, disturbing everyone else at lunch. I'm going to have to see if I can get this on interlibrary loan! I found my copy on Amazon a couple of months ago. 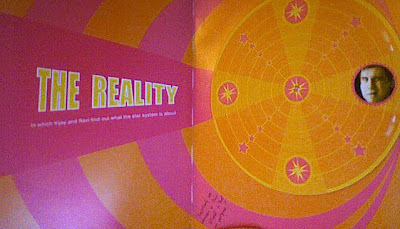 I had no clue how much fun it would be... A Bollywood pop-up book! how cool! Oh goodness. This looks fantastic. Must. Find. Quick question. I'm looking to buy this book online and I keep coming across two different cover images- one is pink and the other is the black and white Abhishek image. Are there two different versions of the book or is one the book jacket art and the other is hardcover art? 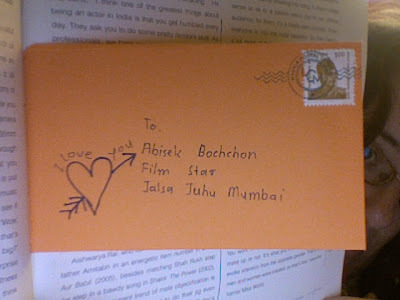 If I recall, mine has a pink jacket and then the image on the actual hard cover is Abhishek. Unfortunately I'm out of town at the moment so can't check my shelf! I'll definitely be on the lookout for this one!